Reposting it here for the community. 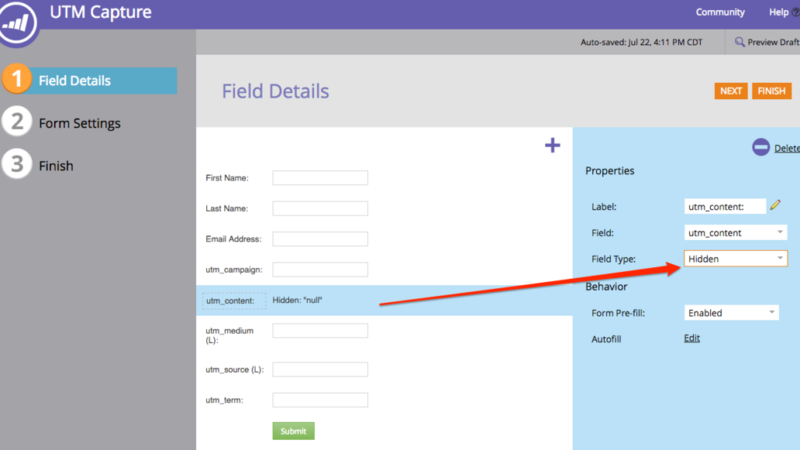 If you are setting this up for the first time, or you have inherited a Marketo instance, I recommend checking to make sure these fields are not already in place, or they exist, but are named something else. If you have access, go to Admin > Field Management, and search for any fields containing "utm" or "ppc" to see if they are there. In the screenshot below, you'll see that all 5 fields have been created and are currently mapped to the SFDC lead and contact records. *Side note: The mapping is important if you want the values for leads or contacts since SFDC treats them differently. Also, if you are creating them for the first time, make sure to do it in SFDC and wait for the fields to sync to Marketo or you'll have to get it re-mapped. At this point, the landing page is just waiting for a referring visit with UTM values. Consider what happens when someone clicks a link, but does not sign up right away? 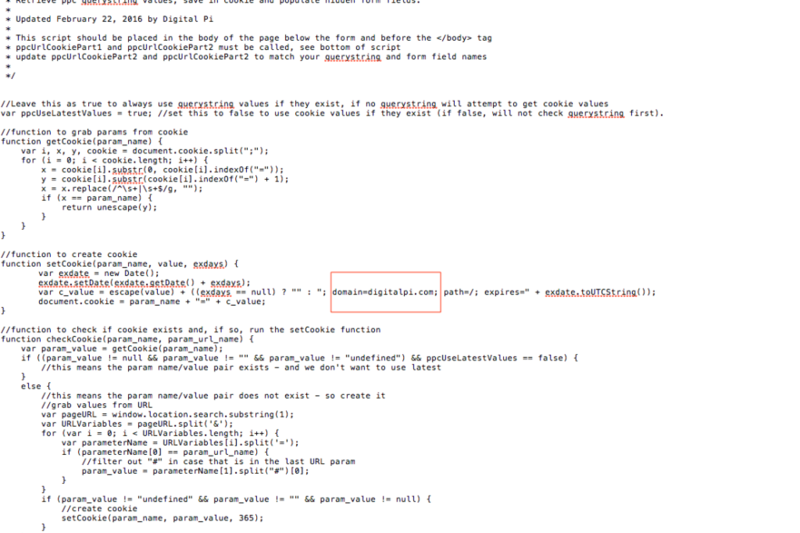 The values from the URL parameter must be present at the time of submission in order for this to work. So if someone navigates away and the parameters disappear, then the UTM values will not be captured. 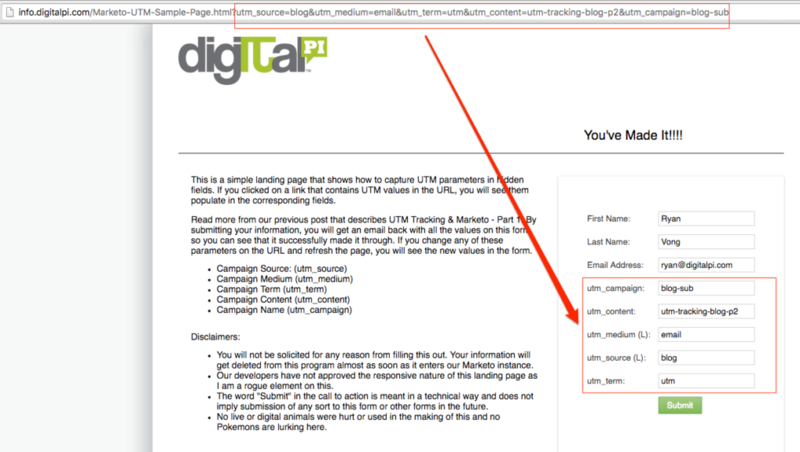 To solve for this, we have created a tracking script that will store any UTM parameters it finds into a cookie. Now when a visitor fills out a form that contains the hidden UTM values on a form, the cookie will store the UTM value across the main and subdomains. *Technical Stuff: You can upload the extracted file into the images directory or on your web server. Before doing so, take note to make one change to the file and re-save it for it to work. Open the file with any text editor and looking for a line that says "domain=digitalpi.com" and change it to your domain. Once set, it won't expire for another 365 days. The script should be place where your Munchkin script is also placed. It's a simple script that does the following.